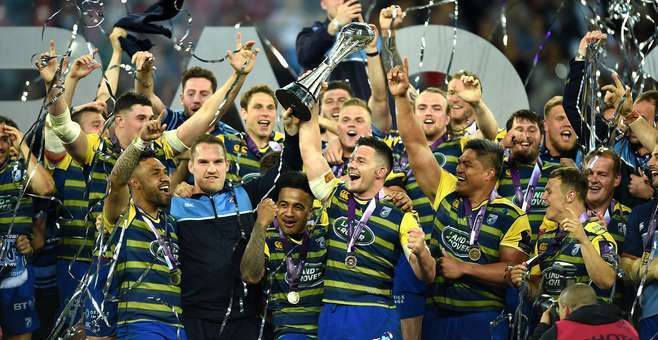 Cardiff Blues won a second European Challenge Cup in remarkable fashion after completing an unlikely comeback from 6-20 down against Gloucester at the San Mames Stadium in Bilbao on Friday. It was a fitting end to a fine second half of the season for Wales' Capital Region, which saw us lose just two of 13 league and European games, qualify for next season's Champions Cup, and win a third trophy since the 2003 re-brand. Friday night was also a perfect send-off for Danny Wilson and Matt Sherratt, as all their hard work over the last three years came to fruition, while Fa'ao Filise, Alex Cuthbert and Damian Welch were awarded a winner's medal on their final games for the club. Finally, that trophy win was a fine reward for us supporters who have stuck through the side through thick and very thin the last few years, and it was great to see so many making the trip out to Bilbao, as well as thousands packing the Arms Park to watch on the big screen. The build up to the game was dominated by whether club captain Gethin Jenkins would recover from a calf injury to take his place in the side, but unfortunately he was ruled out, leaving just Filise and backup tighthead Scott Andrews to survive from the 2010 Amlin Cup winning squad. It was a man who travelled to Marseille eight years ago as an 18-year-old academy prospect who offered Cardiff Blues the chance to get on the scoreboard first though, when Josh Navidi won a turnover on the 10-metre line, and Jarrod Evans slotted the penalty comfortably. Unfortunately, that would be the last notable action for Josh Navidi, who departed after inside seven minutes with a right arm injury, which will now put his participation in Wales's summer tour in doubt. Olly Robinson was a more than competent replacement for Navidi, but Cardiff Blues were clearly rocked by the loss of an important player and Gloucester, in their third Challenge Cup final in four years, were ready to try and take advantage. Using a clever kicking game from Billy Burns and Mark Atkinson they regularly turned the Cardiff defence, pinning us inside our own half, and by carrying high they took away the ability of the Blues back row to show off their skills on the floor. Eventually, thanks to the sheer power within the Cherry and Whites forward pack, they trucked the ball up to the redzone, before Burns produced another spot on kick for Henry Trinder to cross in the corner. Billy Twelvetrees nailed the conversion from the touchline for a 3-7 lead at the 10 minute mark. Cardiff Blues tried to hit back straight away as Rey Lee-Lo broke free down the right wing, but his pass to Blaine Scully was a fraction early to take advantage of a two-on-one attacking system, and Calum Braley tackled the American into touch. In the end, another Evans penalty would have to do for the Welshmen. As the game settled down after a hectic start it was Gloucester who continued to dominate possession and territory, and eventually Seb Davies infringed on the floor to allow Twelvetrees a simple penalty in front of the posts. He was almost back on the tee a few minutes later, when Gloucester again went through a number of attacking phases in the Cardiff half, before going wide. The ball was moved through the hands quickly, but the final pass from Josh Hohneck to Lewis Ludlow was adjudged forward and the try chalked off in fortunate circumstances. At this point the game really seemed to be getting away from Cardiff Blues though. Being pinned in our own half was sapping energy and confidence, we were kicking the ball away a lot, and when we did get an attacking set, it was all very lateral and without the tempo we like to play at. It was inevitable that Gloucester would get their hands on the ball again, and strike what appeared to be the killer blow on the stroke of half-time. From ball just inside their own half, the English side chose to go wide, and a tired looking Cardiff Blues defensive line was not it's usual organised self. Atkinson took the ball to the line, and with inside defenders slow to get up, Willis Halaholo chose to spot blitz Twelvetrees. Unfortunately the centre got his timing wrong and was left for dead by the England international, who promptly drew Scully in before releasing Trinder outside him. Scrum-half Braley tracked well in support and his switch pass back to Atkinson allowed the Gloucester 12 to run in unopposed under the posts. Twelvetrees notched another conversion, and was able to add insult to Cardiff Blues injury with the last kick of the half when Ellis Jenkins was harshly penalised on the floor. Gloucester would have been by far the happier side going in at half-time with a 6-20 lead. If there's one thing that has almost become a given about this group of players now though, it's that you never write them off. The backbone, the commitment, the desire to play for one another and the jersey. It is what has held this second half of the season together. There was a lot of talk about what was said at half-time in Bilbao, with people expecting rallying war cries and shouts of encouragement. The truth is that Danny and Jockey probably just came in to the dressing room and told the boys to trust themselves and play. From the very first whistle of the second half, that is exactly what we did. The tempo returned to the Cardiff Blues game, and big players stepped up to make big plays at big times. Gareth Anscombe was the first of those, sliding in at first receiver on the blindside to grubber kick through for himself to collect. Under pressure near the touchline he chipped ahead beautifully for Tomos Williams to get after, and the scrum-half produced something special. Out-pacing opposite number Braley he hacked on once, dribbled past Jason Woodward, before collecting superbly as the ball cannoned off the post back towards him and held on as he slid over the line. Ironically, Woodward had tried to cynically trip Tomos as he stormed towards the line, but that trip ended up giving the young Welshman a much better chance of gathering the loose ball. A reminder that cheats never prosper. Jarrod Evans added the extras, and when Jake Polledri infringed on the floor, Evans was again on hand to make the kick. Suddenly, 10 minutes into the second half, the score was 16-20 and all was to play for. The first half had also seen Owen Lane forced off with a hand injury, meaning Garyn Smith had to cover the wing in not ideal circumstances, but it seemed he had been scoring tries out wide for years as Cardiff Blues got a second try of the game. With tempo, accuracy and a cutting edge restored to our attack, suddenly Gloucester looked unable to cope. Olly Robinson secured front foot ball with one carry, then Evans found Rey Lee-Lo on a short line and the Samoan rumbled up to the 22. Cherry and White defenders scrambled to re-form, but Evans had the coolest head on the park as he poked a kick through for Smith to gather and score easily in the corner, before the fly-half nonchalantly nailed the touchline conversion. 15 minutes after the break, and Cardiff were ahead again. In Finals rugby things are never straight forward though, and Gloucester were not prepared to be rolled over that easily. With Fa'ao Filise having departed for a last time at the break, Scott Andrews' introduction had seen Nick Williams scrummage on the blindside. The Cherry and Whites spotted this, and with Big Nick slightly less mobile than an Ellis Jenkins, a switch play from the scrum paid dividends. Although Evans was able to get across and cover as Trinder kicked through, the five-metre lineout was a dream for Gloucester as All Black lock Jeremy Thrush set up a textbook rolling maul for James Hanson to score. Twelvetrees kicked another conversion, and two minutes later scored his 15th point of the game when the Gloucester pack won a scrum penalty. Despite a brave 20 minutes after half-time, Cardiff Blues were suddenly seven points down once again. The game was getting away from us, but things have a funny way of working out in sport, and it was actually an impressive piece of Gloucester play that turned the tide back towards Cardiff Blues. A high kick from the Cherry and Whites found Anscombe waiting under it at full-back, but as the Welsh international claimed the ball, he was absolutely smashed by Lewis Ludlow. With Anscombe lying stricken on the floor though, it gave Cardiff the chance to re-group and re-focus. Then it came back to big players making big plays. Ellis Jenkins secured a wonderful turnover in midfield, Anscombe got up to kick us down to the Gloucester 22, and Nick Williams carried hard off the back of the lineout. With the English side infringing again, captain Ellis took us back to the lineout, and when Ludlow cynically came into the driving maul at the side and pulled it down, referee Jerome Garces had no hesitation in sending him to the sin bin. Although the next attack was wasted, Cardiff Blues could now smell blood, and on their next return to the redzone would make no mistakes. Willis Halaholo pulled in defenders with his tricky footwork, Lee-Lo made yards down the left, before Gloucester were stretched again as the ball went through the hands of Anscombe, Dacey, Halaholo and Robinson before going wide to Scully and the American superbly slid in at the corner. Four minutes to go and two points down with a conversion to come. Did we kick it? Of course we didn't, we never do things the easy way! All credit to Gareth Anscombe though, from getting cut in half and missing the conversion to producing a superb kick pass for Garyn Smith to tear up the field and win a turnover, and then stepping up for that kick with less than two minutes left. Even on watching the replay of the game it's difficult to actually watch him take the kick, but it flies through the uprights straight and true, and after a superb Olly Robinson claim at the restart, CARDIFF BLUES ARE EUROPEAN CHAMPIONS ONCE AGAIN! What a group of players, what a coaching and support staff, what a set of supporters, what a season, what a trip, what a day, what a game. I cannot speak highly enough of everyone who was involved in that win, there is only one way to sum it up, and that is to the tune of Sloop John B.
I noticed the forward pass call by Garces was probably based upon the pass received by Josh Hohneck not the flat one he gave. So that wasn't really 'fortunate'! Ah interesting, I shall watch it back tomorrow!